Making of Yogi – Cleric to Chief Minister! Yogi Adityanath strikes a fine balance between Hindutva and Moditva. His ambition drives him from Gorakhpur to Lucknow via Poorvanchal. He is aware of that the road to Delhi will be via Lucknow. He is undoubtedly the most popular BJP leader in the state, not just among the party supporters but among the cadre as well. He represents the upper caste ‘Thakur ‘as Ajaya Singh and for the rest; he is Yogi, the posture boy of Hinudtva where religion overshadows the castes. Clad in his trademark saffron-coloured robe, Aditayanth, a firebrand Hindu leader is known for his fiery orator skills. Yogi was born in a Garhwali Rajput family in the village Panchur, Pauri Garhwal in Uttarakhand. He is holding a Bachelor’s Degree in Mathematics from the H.N.B. Garhwal University in Srinagar, Uttarakhand. Adityanath was elected to the Parliamanet in 1998. He was the youngest member of the 12th Lok Sabha at 26. He has been elected as an MP from Gorakhpur to the Lok Sabha in the 1998, 1999, 2004, 2009 and 2014 elections. He was made the Mahant (head priest) of the Gorakhnath Math after the demise of Mahant Avaidyanath in September 2014. He is also the founder of the Hindu Yuva Vahini, a social, cultural and nationalist group of youth. One may like it or not but he is the right choice at this point who can take strong decisions to improve the law and order. At 44, he is young, bold, popular, and non-corrupt who can give good governance and take the state into path of progress. 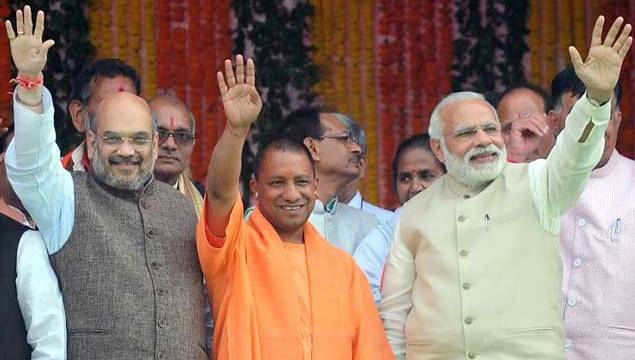 The two deputy chief ministers Keshav Prasad Maurya and Dinesh Sharma will stress on Moditva and enable the development while Yogi represents Hindutva at large. The priest-turned- politician, a strong man of Gorakhpur, has a huge opportunity to transform Uttar Pradesh as Uttam Prasesh. Time will say if he can modi-fy the UP and create history. — Amarendra Mohanty is an IT Professional having 15+ yrs of experience. He is doing research on Big Data Analytics, a visiting professor (Guest lecturer) to VIT, Chennai and other Universities. . He is also Social Worker.